I am wondering if you can help me, or at least point me in the right direction to someone who can. I was in New Zealand last December and a friend of mine has acquired an old style mini with the attached registration plate. The MINI has had a number of modifications, but I said I would try and find out as much as I can about its history. I have looked on the internet, but I am struggling to find any information, could it be possible it was manufactured in Australia? Any help would be gratefully received. I traced it to 1969 - 1974 UK build. 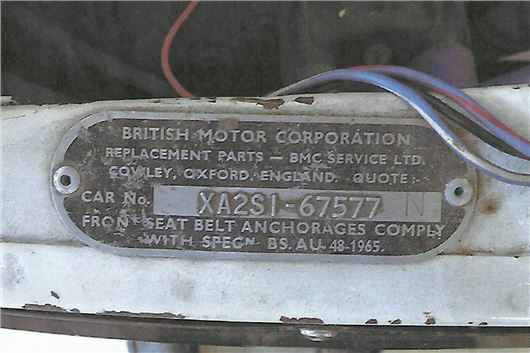 : https://www.minimania.com/Mini_Chassis_VIN_and_Commission_Numbers__Part_I__Revised_#69 / BMC or BLMC or BL or Austin Rover or whatever it was called in the general craziness did build cars in Australia, even some stand-alone models, but any Minis would have been assembled from CKD parts rather than built from scratch or simply exported as complete cars. I have run a Skoda Superb auto diesel estate from new: 45,000 miles and found it a great car. What are your views on a Mazda CX-5 auto 175 Sport Nav on 19-inch tyres? (They concern me.) Also, have you heard of any DPF problems? Now semi-retired I will only do 10,000 miles a year. So would it be sensible to go down the petrol route? CX-5s handle better on 19-inch wheels and the tyre profiles are 55, which is deep enough, but there were some complaints of road noise when fitted with original Toyo tyres. Kumho Crugens are better. Yes, oil contamination was a problem, cased by switching off while the DPF was actively regenerating. There was also an issue of failing injector seals dribbling diesel fuel down the bores but the issues seem to have been resolved. Obviously totally the wrong car for repeated short runs from cold. Take a couple of short runs of less than 10 miles and the next run has to be 20 miles plus or you will start to have DPF problems. Always try to keep the revs up to around 2,000rpm after starting. Don't try to run at very low revs for as least 5 miles. You can get a CX-5 2.0i manual in the UK, but, unfortunately, through a CX-5 2.0i automatic is available in other markets (and is available in the CX-3), it is not currently imported to the UK. A good while ago, Honest John said that one of the reasons Japanese cars were more reliable was that the suspension system was constructed in a different way from European cars. Is this still true, and in what way is it? Also, which model of the Honda Jazz should I not buy? Is it the one with the I-Shift? Most European springs come from a Swedish spring manufacturer where the tempering of the wire and of the springs themselves can be affected by low winter temperatures when the springs emerge from the factory to be transported to car manufacturers. This doesn't seem to happen with Far Eastern springs. Yes, avoid the Jazz i-shift. Only buy a Jazz with the CVT-7 CVT auto or (in some markets) the 5-speed torque converter auto. I am nearing completion of a deal to buy a 2017 Mercedes C220 diesel with a 9-speed auto transmission. My current C-Class has 7 speeds. Source is MB used cars in Manchester. 2,500 miles. First reg May 2017. Have you any reservations about the 9-speed transmission? Lovely. None of us had any problems with it in the C-Class or the E-Class. Especially good with the diesel engines: /road-tests/mercedes-benz/mercedes-benz-c-250d-cabriolet-2016-road-test / And /road-tests/mercedes-benz/mercedes-benz-e-class-cabrio-2017-road-test / No reader complaints. Last year I started looking around for a replacement for my 2010 C70 convertible. The three contenders were the Audi A5, the BMW 4 series and the C Class Mercedes. The only one to come with a spare wheel was the Audi and I subsequently ordered an A5 cabriolet on the understanding that a space saver spare was standard specification. My C70, my wife's XF, my daughter's A3 and my son's Fiesta all had/have spare wheels. I took delivery of the car last month. The salesman took me over the car and then opened the boot. There was no spare wheel, only a pump and some wheel gel. No-where was there any mention in any of the sales literature that this was an option. The A5 cabriolet in the showroom has a space saver wheel fitted as standard. I took delivery on the understanding that Audi would provide me with a space saver wheel, and the parts were duly ordered. The mechanic who tried to fit the parts found out that they didn't quite fit properly and wanted help from Audi Germany to find out how to do so. Audi UK has been informed by Audi Germany that the wheel cannot be retrofitted for 'safety reasons' because the car has not been tested with the spare wheel in situ in the wheel well in the boot. Audi Germany has informed Audi UK that if the spare wheel is fitted by the Audi dealership, then whoever fits the wheel will be personally liable for any problems, and there may be issues with the warranty. The dealership are doing the best they can, but Audi Germany are being extraordinarily inflexible and downright unhelpful, stating that there was a problem with the sales material, not with the factory, for supplying the wrong specification. Audi UK has offered £500 in compensation, but this doesn't get me a properly fitted spare. I have tried finding the appropriate parts on-line, so that I can fit them myself, but with no luck so far. Ultimately I know I can reject the car on the grounds of 'not fit for purpose' or not as ordered, but this seems b****y stupid over what should be a simple matter, and would leave me carless until a replacement vehicle is ordered and arrives. That's Audi for you. Just about everything on an Audi these days is an extra cost option. You can easily pay £20,000 more than the list price of an Audi in extras alone. Last week I drove a new A8 listed at £76,000, but with the extras it had it was £108,000. So behind all of this is the sheer greed of Audi failing to supply its cars with spare wheels that at most costs the company £30 more per car but for which they prefer to charge £200 for as an 'extra'. If I was you I would reject the car for a full cash refund in utter disgust or demand a direct replacement for exactly the same price, which comes ready fitted with the space saver spare you expected and for the dealer to keep you mobile in the meantime. Fitting a DIY space saver remains an option, but why should you do that when it has been deemed to be unsafe and you would be making yourself liable in the event of a crash. I read your reply to the letter concerning the DSG box in a Golf SV. You said that you should not hold the car on the brake while stationary in traffic because it would wear the clutch pack, instead you should put the car into Neutral. When I bought my Skoda 1.2TSi with the 7-speed DSG dry clutch gearbox I was told by the chief technician at the main dealer I bought the car new from that as long as I had the footbrake firmly on then the clutch would be totally disengaged and there was no wear on the clutch pack. He also said not to hold the car on the handbrake, as that would cause wear. Welcome your clarification, I can see that if you ‘feather’ the foot brake with a DSG gearbox that it’s like slipping the clutch on a manual gearbox but was the technician wrong to say that if the car is held firmly by the footbrake the clutch pack was totally disengaged and would not cause wear to the clutch pack? We have a 1990 Mercedes 300CE 2-door automatic coupe. It has done 110,000 miles from new. I bought it in 2000. The previous owner from new was a Mr. Reed and the second owner was his wife Mrs. Reed. Therefore that made me the third owner but it has only been housed at two homes. It has been regularly serviced, has current MOT to April 2018 and runs very smoothly. For its age it is in pretty good condition. I have just bought a new car and wish to sell the Mercedes and wonder if you could advise what price I should ask and also if there are any specialist places that may be interested. The best way to sell a car like this is via a classic car auction such as http://www.historics.co.uk or http://www.brightwells.com (many more if you Google <classic car auctions>. Alternatively, specialist media such as 'Classic Motoring' that seems to have one of the largest classic car classified sections. Hagerty currently values it at $5,100 (£3,650). (https://www.hagerty.com/apps/valuationtools/1990-mercedes~benz-300ce). My wife and I both drive my Mazda 6 diesel Tourer and her MX-5 and have maximum no claims discount. Now partially retired, I have additionally bought a small petrol car, a Skoda Citigo (super buy) for short local runs not ideal for the diesel, and was astonished that my NCD cannot be taken into account for its insurance. My modest achievements in life don’t include driving two cars at once. Is this unfair or am I missing something? You need to switch to a Multicar policy that consolidates the NCD for all the cars. Admiral does one. In an answer on your site, you said, "If it’s your own car, best stick to Super: any that has advertised benefits because if the benefits are advertised they have to be capable of substantiation or the ASA bans the ads". That is why none of the fuel companies state any definite (aka actionable) statements. It is all "helps to...", "giving you our best cleaning power...(which means it could still be crap)", "designed to help clean and protect your engine..." (it could still help, but not a lot), "new Shell V-Power Unleaded is boosted with 30% more cleaning molecules than previous formulation..." (notice the more cleaning molecules does not mean 30% more cleaning. Even if it did, it could still be from a very low floor). In short, there are no statements on any of the fuels' sites that could involve ASA action, because they do not claim anything. It is all implication, smoke and mirrors. You sound like you are in the pockets of the fuel companies. That's a reasonable legal point that might be argued by a barrister. But just imagine if it went to court and the fuel company was challenged. It might 'win' its case on the legal niceties of using these weasel words. But its reputation would be, as they say, "ruined." The separate fact is that I have now answered more than a million readers letters and emails. Engineers from Volvo, Ford and FIAT tell me that latest generation of engines are optimised to run on Super because they have to be calibrated to get the best possible results in the mpg and emissions tests to which they are subjected. Car manufacturers may advertise that they will run on ordinary fuel. But the fact (and it is a fact because I received evidence almost daily) is that most fuel system faults that readers suffer from are related to using ordinary so-called 'premium' petrol and diesel and most of these readers find that by using Super they clear the problems up. Back in the late 1980s when 95 Ron unleaded was introduced, anyone with a decent car had to have it retarded to run on the low octane fuel. I had my GTI retarded and it ran like a pig. Then Texaco introduced 'Cleansystem 3' 98 RON Superunleaded. I started running on that and had the car advanced back to its original setting. It was tested by Wheelbase of Hersham prior to its MoT and they found the emissions were so low they were almost equivalent to those of a catalysed car. Since then I have always run on Super petrol and diesel and had no fuel system problems in more than 1,000 cars. My son recently bought a 2008 Peugeot 4007 from a used car dealer, but without proof of a full service history. He was assured when he took a test drive that there was a complete record, but when he collected the car there was no manual or service history. They eventually produced a manual and service record up to 2013, but said they could not find the rest, despite going back to the owner. He talked to Citizen’s Advice and then wrote to the dealer (within the 30 days) with 3 options: find the records; pay him 10% of the value (since it will be more difficult to sell in due course); or take the car back and refund his money. The dealer has rejected all 3 options and now says he didn’t tell him it had a full service history. There is a record of the car’s MoTs via the DVLA website. How important is the full service history, please? He is concerned that he can’t check that all important service replacements/actions have been carried out and that he will find it more difficult to sell the car on in due course. The car has only done 68,000 miles, which is a bonus. Is there anything else that he can do please? I have a three-year old Mercedes GLC 2.1 Diesel and would like to replace it with a new HYBRID. I have been looking at the Lexus RX 450h. I believe BMW and Volvo are going to bring out a HYBRID range. What would you recommend I go for? My average mileage is around 7,500 a year. I have a 2004 KIA Rio. The engine died whilst I was driving and apparently it was the timing belt. So I was made to replace the timing belt and also some bent valves. Now I’m having problems with overheating. The car seizes while I’m driving, and won’t start any more, but doesn’t show signs of overheating on the dashboard. When the mechanics force-start it then the heat gauge starts rising and the car overheats. Do you have any advice for me? "Car written off 1 month before new car due"
To buy a cheap car prior to you getting the new, will involve a new Ins Policy, as your current Policy will be cancelled on write off, which will then have to be modified, at a cost when the new car arrives. Couple of points: since 2009 many BMW auto have been fitted with the short stubby selector. This has a button on it to engage 'Park' which locks the gearbox. I used this to hold the car at traffic lights if there was anything behind me so as not to blind drivers with the brake lights. Why do people buy cars supposedly with a FSH but the dealer does not have it to hand although they say they will forward it asap?If it aint to hand walk away or negotiate a lower sale price. Why does anyone continue to drive a car when a warning light, especial for oil, lights up on the dashboard? Utter lunacy. Stay away from Admiral multi car policies. In fact, just stay away from Admiral full stop. The reason HJ may not have had a problem in 1,000 cars using "super" fuels is that if he has had that many cars, he has not had them long enough for these types of problems to occur. The letter above about fuel advertising claims was just like the one I was going to write. It was so similar, I thought I HAD written it. It was just (another) senior moment. They weren't all quick flips. Kept some of the smokers for several years, then handed them over to other members of the family. No fuel system problems with any of them.